Full Membership of the Association of Professional Mole Catchers is applicable to commercial mole catchers in the UK and who operate in a way that meets with APMC's definition of Professional Mole Catcher. must be mole catchers whose livelihood or an identifiably separate part of their livelihood and business presentation identifies them as a commercial mole catcher. 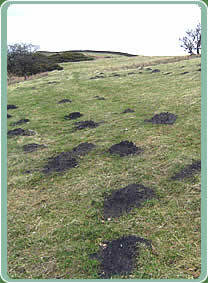 Full Membership of APMC offers several advantages to professional mole catchers. APMC works toward keeping your mole catching interests safe. APMC invests in moving occupational mole catching forward. Full Membership can also offer several interactive opportunities to professional mole catchers. APMC works closely with mole catchers enrolled as Full Members when determining the services it delivers and how it develops policy. Any Full Member who wishes to present an idea (or concern, or whatever) for consideration by the Association can expect that interest to be considered formally, fairly and thoroughly by APMC, and will receive a full and recorded response. Also, any Full Member might apply to be considered for co-option to APMC's Working Committee as an office bearer, or might be invited for co-option. * APMC's Concessionary Membership Fee is a discount provision made available to applicants for APMC membership who can fulfil certain criteria. Copyright © 2009 - 2019 Association of Professional Mole Catchers (APMC). All Rights Reserved.